Since Snow White premiered in 1937, Disney movies have influenced generations with their magical stories and impressive animation. As the days of classic 2D animation are replaced with the new doe-eyed CGI characters, some of us are feeling a little nostalgic for the days when each detail was painstakingly drawn, animated and colored for our unique viewing pleasure. One of the most beautiful and underrated Disney films, in my opinion, comes from the Disney renaissance era. It’s time to talk about The Hunchback of Notre Dame. The Hunchback of Notre Dame premiered in 1996 as Disney’s 34th animated feature. Despite its relative success at the box office, and the Academy Awards and Golden Globe nominations for the score, Hunchback remains one of Disney’s darkest films. For anyone who doesn’t remember, it definitely deals with mature and religious themes. This movie deserves a special shout-out because of it’s timeless and priceless message of acceptance, freedom, and justice. Quasimodo, our protagonist, faces undeniable prejudice because of his appearance. That is until we meet the beautiful and enigmatic Esmeralda who changes his world. Cruel and powerful Judge Frollo keeps Quasimodo locked in the bell towers of France’s famous cathedral, demeaning and hateful remarks about how the world sees him. Ultimately, Quasimodo’s free-spirit finally propels him to the streets of Paris where he encounters the lovely Esmerelda. Regardless of her own social status, Esmerelda stands up for Quasimodo. She shows him the exact kindness that Frollo had convinced him he would never receive. For me, Esmeralda exemplifies the perfect role model. Her speech to Frollo about justice and her solo song “Outcasts,” sung in the beautifully animated interior of the Gothic cathedral, still moves me. She embodies the very opposite of Frollo. Esmerelda opens the floor for a complex, layered evaluation of Frollo’s “righteousness” and his abuse of Quasimodo. Her relationship with Captain Phoebus places her on equal footing with the courageous soldier and makes for a power couple unique to this era of Disney movies. The cathedral itself plays the character of the witness. The gargoyles of Notre Dame come alive as companions for Quasimodo (and some comic relief in this heavy film). 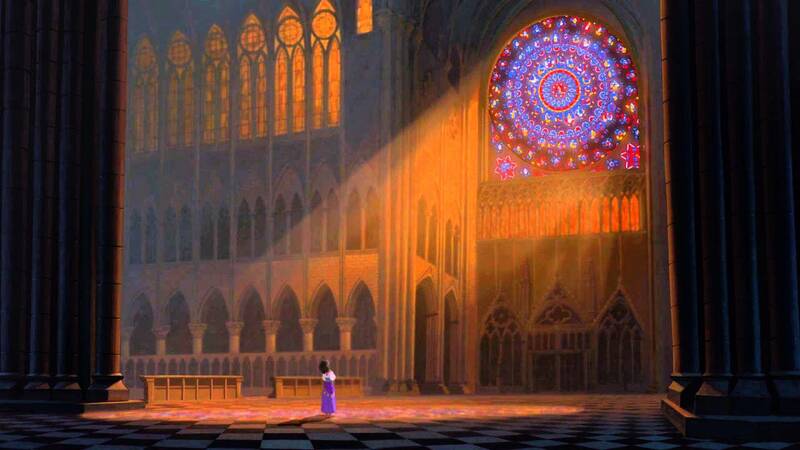 But, at the beginning of the film, “the eyes of Notre Dame” witness a crime of Frollo’s. This later forces him to feel and act as though he’s been judged. 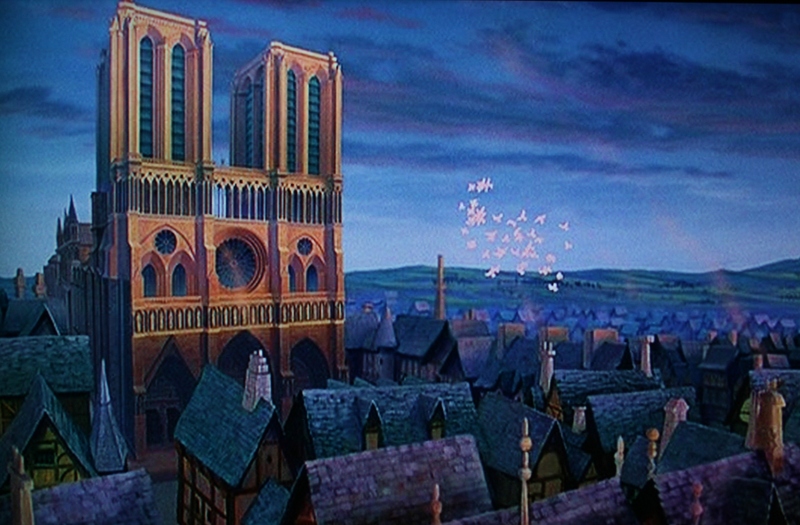 Towards the end of the movie, Notre Dame is the scene of a battle. The people of Paris are moved to protect this holy place all that it embodies. To me, this is effectively acting on the expectations of the cathedral itself. Considering how long and how diligently the Disney animators studied and sketched Notre Dame, it is not surprising that they brought liveliness to the impeccable stone carvings unique to the Gothic style of the cathedral. The Hunchback of Notre Dame, whether you’ve never seen it or if it’s been a while, is worth revisiting. Some of the themes might be missed by kids, but the animation and the music make it a lively, fun experience. I know from experience that it sticks in your brain and engages all kinds of forward-thinking conversations.